Bill Robling is Benjamin Franklin, a Franklin for all seasons and all reasons. You will meet Benjamin Franklin brought to life, not only in appearance, but in his entire persona. Bill has been an actor for more than 35 years, and has portrayed Dr. Franklin for more than a dozen years. In addition, he is a serious student of Dr. Franklin’s life and times, having logged thousands of hours in study and work with some of the most notable Franklin scholars of the day. An actor and student of history, Bill Robling is also an entertainer. You will meet Benjamin Franklin the humorist, as well as Franklin the civic leader, author, publisher, politician, scientist, diplomat and printer. 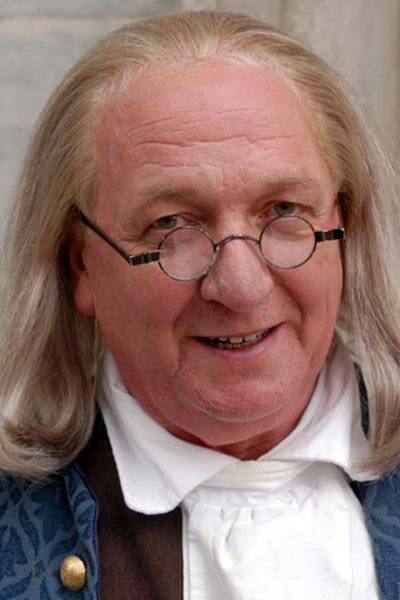 Bill Robling portrayed Dr. Franklin in the 2004 History Channel film, BENJAMIN FRANKLIN: an American Life. He has also portrayed Franklin in films for National Geographic Channel, the University of Va. Library, and others. Bill is a certified Training and Development specialist, and has facilitated convention programs for corporate groups. He presents the life and times of Benjamin Franklin on a regular basis to school and senior groups. Another popular appearance is Dinner with Franklin, where history-loving people sit down for dinner and conversation with Ben in historic places. Whatever your event or venue, whether a welcome address to a group visiting Philadelphia, or bringing early American history to another city, or just meeting and greeting your gathering, Benjamin Franklin is a lively presence. And Bill Robling brings Franklin to life.